A new Gallup poll now has Young ahead of Hill by nearly 65 points. "Frankly, I can't envision any scenario in which Baron Hill can recover from this," political strategist Mary Matalin said on Meet The Press Sunday, adding that it was an inspired and ingenious decision to include both the first and last name of the candidate on the sign. "Yes, the bold capital letters capture our imagination, but they also assure voters that Todd Young will meet all political challenges with indomitable vigor and integrity." 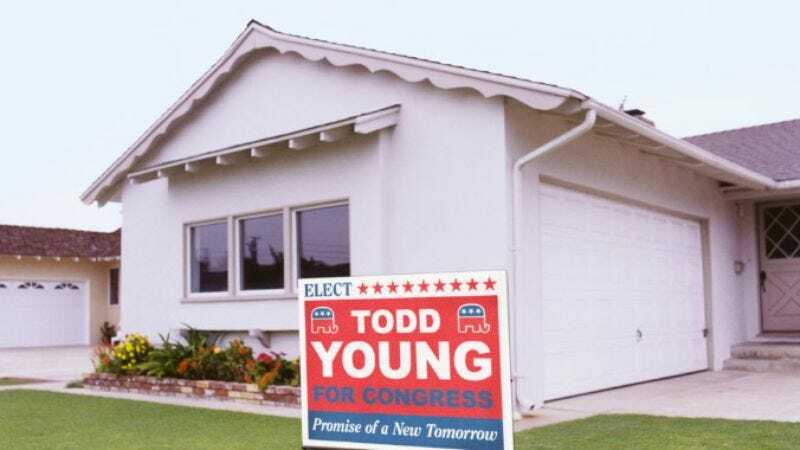 "If that sign could talk," Trout continued, "it would say, 'Voting for a candidate other than Todd Young would be an affront to everything that makes this country great." The dire predictions for Hill appear to be coming true: Local donors and the national Democratic Congressional Campaign Committee have cut off funding to Hill, and reports from his election headquarters reveal a campaign in crisis mode. The few remaining workers who have not defected to the Young camp have been working 20-hour days, desperately scrambling to right their candidate's ship. "That sign has destroyed us," said a senior Hill staffer speaking on condition of anonymity. "We've been brainstorming nonstop for days, and we think the only way to regain any ground would be for Baron to somehow appear in each constituent's living room, if only for 30 seconds, and either state his moral and political beliefs while his wife and children stand at his side or else rip into questionable statements Young has made in the past." "But unfortunately, there's no way to achieve this," the source added. At press time, the identity of the individual who placed the sign in his front yard, and essentially handed the Republican Party another seat in what figures to be a pivotal midterm election, was revealed to be Herb Whittaker, a 53-year-old hardware store employee. "I wanted to show my support for Todd Young," Whittaker said. "So I put a sign on the lawn."